when joined to juices flowing from the vine. Our Roman vineyard is on the Regina Viarum, one of the most ancient Roman roads, 9 miles of the Appia Antica. The setting is stunning: villas and tombs, aqueducts and ruins stand framed by the Alban Hills (Colli Albani). The estate is not far from the Campidoglio, in the very center of Rome, and extends over 25 hectares in the Park of the Appia Antica. It is incredible to be so close to the city at the same time as having a spectacular view of the Roman countryside. We take care to preserve the historical nature of the place. The soil is mostly composed of volcanic rocks, and is particularly rich in basalt. Its origin is due to a lava flow dating back to more than 20,000 years, and the consequent richness in minerals makes the ground particularly suitable for viticulture. 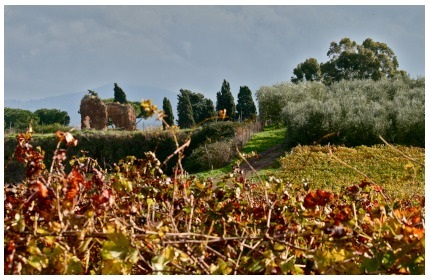 The vineyard’s position means that it is constantly exposed to the sun and the sea breezes. 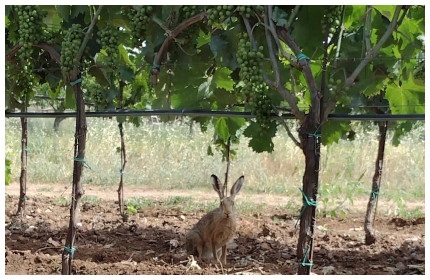 All these factors, together with the favorable climatic conditions, enable us to produce high quality organic wines.